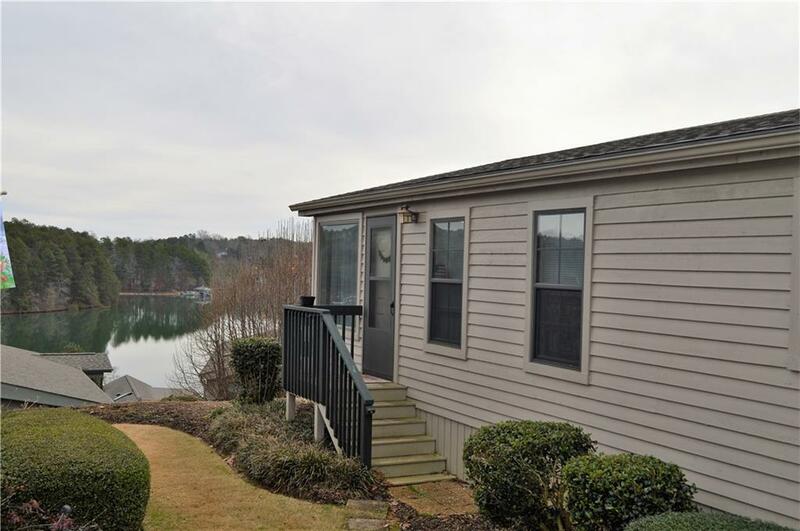 Fully furnished, turn key waterfront cottage getaway situated among beautiful views of Lake Keowee. This comfortable retreat boast panoramic lake views all year. Spacious, open floor plan in a maintenance free community, this two bedroom, two bath lake retreat is truly a vacationers delight. A comfortably decorated cottage that is available with most furnishings, including a golf cart, and ready for immediate occupancy. Great for weekends at the lake, Clemson gamedays and year round lake fun! *New roof and enclosed all season porch 2018 Community amenities include a fabulous lakefront lodge and swimming pool, marina, beach and walking trails. HOA includes landscaping maintenance, private gated community, water, sewer, trash service, pool, clubhouse, walking trails, fitness center and more. Modified tax structure add to the savings of this remarkable Keowee waterfront buy. ** Exterior tie up to dock can be rented for $15 a day for resident weekend use only (Friday-Sunday). Annual Boat Slip lease available as well as enclosed lakefront kayak storage and secure boat/trailer/RV storage. All features located on premises at a nominal fee. Please call Listing Office for details.